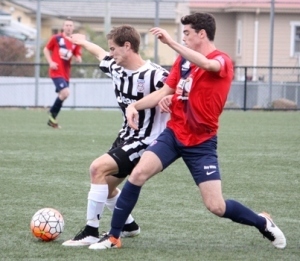 Hobart JEEP Zebras and South Hobart fought out a nail biting 2-2 draw at KGV Football Park this afternoon afternoon as Zebras recovered from a disastrous start to salvage a point. Kobe Kemp and Nick Morton were the stars for South as they started like a house on fire, whilst the influential players for Zebras in their spirited fightback were Jayden Hey, Adam McKeown, Luke Huigsloot and Michael Maiorano. It was a thrilling contest between two of the PS4 NPL Tasmania heavyweights. Under dark and cloudy skies on a cold Autumn afternoon, a good old fashion slug fest unfolded. Zebras, who traditionally have started slowly against their big rivals, came out of the blocks firing. For the first five minutes, they were on top of South Hobart. But alas, it was too good to be true for the Zebras as South Hobart’s first foray forward ended in disaster. In the 7th minute, a misplaced kick from a free kick out of defence was intercepted by Darcy Hall and he powered towards goal, beating Henry Moody before unleashing a drive into the bottom left corner to make it 1-0. In the 10th minute, it was again Hall who broke down the right wing. The youngster was afforded too much space by Sam Conway, and he streamed towards the byline before cutting a perfect ball back to Morton who smashed home a volley into the top left window first time to make it 2-0 and send shockwaves through the Zebras camp. In the 14th minute Ludford injured his ankle as Henry Moody fell onto his leg, he was soon substituted and replaced by Alex Walter. South Hobart were scintillating for the next 20 minutes and completely controlled the tempo of the game, pulling apart the Zebras defence with incisive passing and quick decision making. The Zebras on the other hand were sputtering and faltering under the pressure of South Hobart’s press, unable to make a move forward without looking horrendously disjointed. Henry Moody was subbed from the field in the 22nd minute after suffering what looked like a lower back issue. The Zebras moved Hey into centre back and introduced Maiorano to the game. South continued to boss the game until the final ten minutes of the half when the Zebras finally got a foothold in the momentum of the game. They had a couple of half chances, and then in the 4th minute of added time, won a free kick about 25 yards out. James Sherman stepped up and lashed a curling effort against the bar that fell to Huigsloot. Huigsloot headed it back across goals where Jordan Muller headed it into the back of the net to make it 2-1 and breathe some life into the game. The Zebras came out firing early in the second half and in the 48th minute it was 2-2. A long ball found the head of Huigsloot and his deft flick on was met by McKeown who brushed off one defender, before cutting past another and then smashing a shot into the bottom right corner past a despairing James Wilson. In the 71st minute, Morton ran onto a through ball leaving his marker for dead. He spotted the ever reliable Graham Wright off his line and attempted to lob him only to see his shot smack into the post and bounce away to safety. In the 74th minute, Liam Quaile received his marching orders for a second bookable offence and one felt the momentum might shift towards the Zebras, but it wasn’t to be the case. The Zebras, inexplicably, didn’t chase the game, and almost ended up playing five at the back, seemingly happy to take a draw. In the 89th minute, substitute Ben Hamlett looked like he had been put through on goal only for the ever industrious Hey to track his run and lunge at the last moment to block what looked like a goal bound effort. In the second minute of added time, the Zebras had a great chance to score after Wilson’s indecisiveness led to a turn over that saw McKeown cross to the back stick. Huigsloot worked his socks off and lunged at the chance only to see it just out of reach of his long levers. In the fourth minute of added time, Hamlett again had a chance to steal the game for South as his speed proved far too much for Sherman to handle, but he skied his effort as he strode in towards Wright one on one. It was a classic encounter between two very good footballing sides and shows that the title race could go right down to the wire with two full rounds of football remaining. South Hobart coach Ken Morton was disappointed with the result, “very disappointing (result)”. “They went with 5 at the back (when we went down to 10 men)!”. So the first round of the PS4 NPL Tasmania season is done and dusted and the Zebras lead the ladder by solitary point from Devonport. It was an absolute belting way to finish off round one of the roster and the next time these two teams meet there is sure to be plenty riding on the line again.